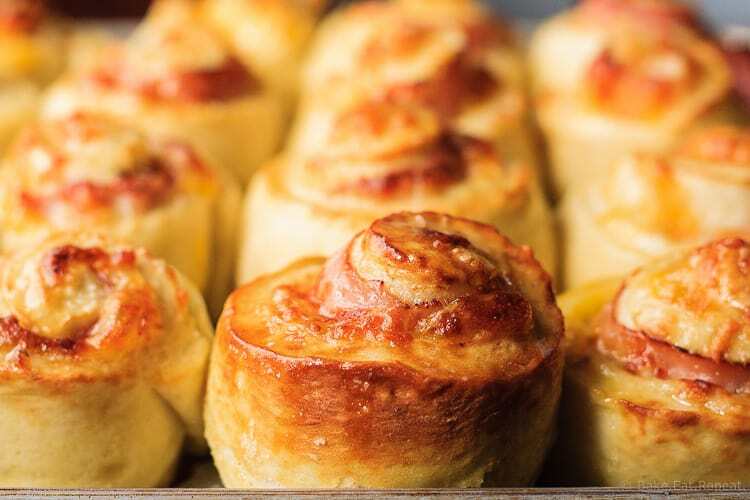 Ham and Cheddar Pretzel Rolls - Bake.Eat.Repeat. Soft and fluffy ham and cheddar filled pretzel rolls – easy to make and perfect for on the go meals, or just hot and buttery straight out of the oven! These rolls are fantastic. I’m just going to say that right off the bat, because you most definitely need to just skip reading this today and scroll right down to the recipe so you can make them for supper tonight. Seriously. It needs to happen. Not that I really had to tell anyone that. 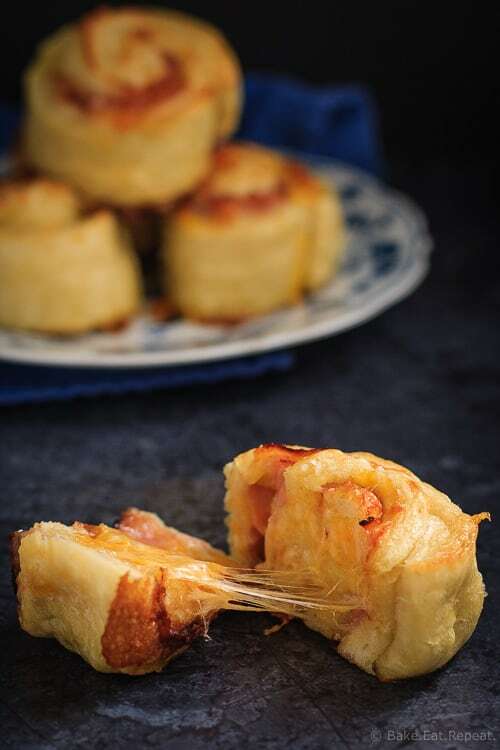 These are basically a homemade soft pretzel (which is already the best tasting thing on the planet) filled with ham and cheddar and made into a cute little roll that is perfect for supper, to pack into a lunch, or to grab as a snack. Any and all of the above. Fantastic, I tell you. You could probably even make them a bit healthier and use some whole wheat flour in there. I didn’t. I went with amazing, fluffy, all white pretzel rolls here, because it seemed like a really good idea. But you could use whole wheat. I will be doing that next time to healthy them up a bit. These ham and cheddar pretzel rolls are a variation of my absolute favourite recipe to make when we have people over, soft pretzel bites. The beauty with this version is that it’s basically a sandwich rolled up into one tidy little parcel, so it’s perfect for on the go meals. We had them for dinner the other night when we were all running in different directions. The kids ate them in the car on the way to their sports, I grabbed one to have while watching said sports, my husband had one (or a few – they’re so good!) when he got home for a late supper. We all thought they were terrific. Best hot from the oven, but they also reheat well, and freeze well, and taste great cold. That’s a versatile meal. I’m already thinking of other versions to make – cause pre-made, homemade, packable lunch options waiting in the freezer? That’s gold. 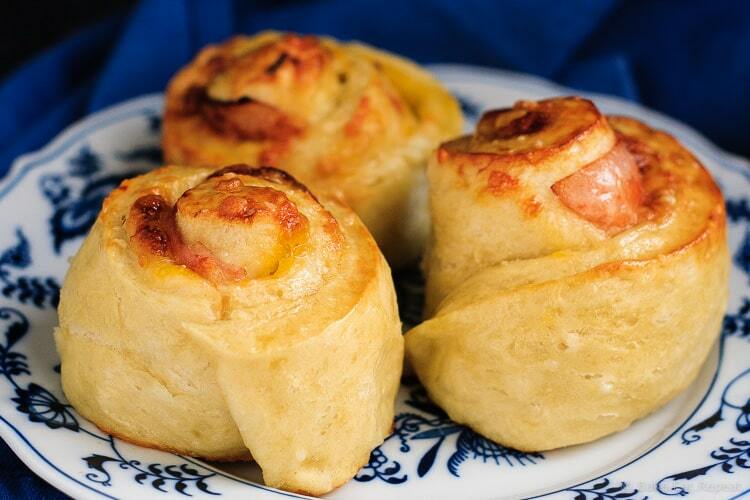 I’ve also shared this Ham and Cheddar Pretzel Roll recipe over on Food Fanatic. I've never heard of a baking soda wash before. What does it do to improve the rolls?